Summer grass is an unsightly grassy weed can spread rapidly. If the weed is left to flower and set seed, the seed can lay dormant for several years and be a nuisance for years to come. Going by the scientific name ‘Digitaria sanguinalis’ it is commonly termed summergrass, but sometimes called hairy or purple crabgrass. This annual grassy weed is tufted and mat-forming and can inhabit a wide range of soils, although its natural habitat is sandy soil and loams. 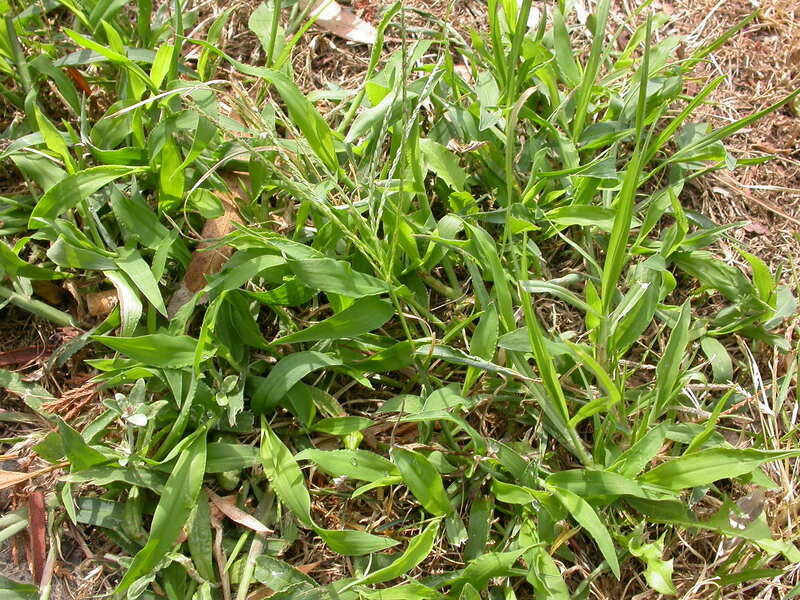 Summergrass can grow to 30 cm tall and spread to 1m wide if left unmown. Culms (stems) are slender, ascending from a decumbent base. The relatively wide leaves which can be greater than 5 cm long are soft and hairy on the underside of the foliage; the sheaths are also hairy and the ligules are papery to the touch. The stems often have a red to purple tinge to them. The stolons of the plants root down at nodes, which can dramatically increase the area, the weed encompasses. Inflorescence is more or less terminal, to 15 cm, slender, spreading, 2 to 10 per inflorescence. Summer grass flowers in summer and autumn when it seeds profusely. The seed can remain dormant in the soil for several years before germinating. Summer grass has shallow fibrous roots. A widely distributed weed, summergrass is found in tropical, subtropical and temperate regions. Summer grass is an annual grass weed propagated by seed. Seeds develop in late summer and autumn thus ensuring an abundant infestation during seasons thereafter, unless a pre-emergent program is introduced. When temperatures are optimal, summer grass emerges 2 to 3 weeks earlier than crowsfoot (Eleusine indica). Crowsfoot is a fast growing grassy weed that stands prominently above the normal height of managed turf and can pose a serious trip hazard. There are many common names for this weed including but not limited to crowsfoot, crabgrass and goosegrass. Scientifically this grassy weed of turf is known as ‘Eleusine indica’. ‘Crowsfoot’ is a prostate or tufted annual grass that can reach 50 cm in height. Stems are whitish, flattened and prostrate branched – often forming mats. Leaves have loose, overlapping, flattened sheaths and shiny green leaf blades up to 30 cm long and 8 mm wide. Ligules are very short. Inflorescences are 2-13 spikelets resembling a zipper radiating from the stem. Spikes are up 17 cm in length and 5mm in diameter. Crowsfoot has a very strong, dense fibrous root system, which can be hard to pull out. Germinating crowsfoot seedlings are very distinct when seen growing in the field. The emerging tillers from the centre of the plant a white to silver in colour at the base of the leaves. The ligule is toothed, membranous and divided at the centre. Upon closer inspection, the crowsfoot plant may be smooth and glossy or contain hairs only at the base of the leaf depending on the genotype. Crowsfoot is naturalised from sub temperate to tropical climates. It is a problematic weed on golf greens, tees, fairways and sports fields that receive high wear and or soil/surface compaction. Crowsfoot is an annual grassy weed reproduced by seed. Crowsfoot seeds germinate rapidly, usually within 7 to 14 days under moist conditions, strong light and fluctuating temperatures, on germination, the first leaf, about 1 cm long, tapers very suddenly to a point and may be pressed quite flat on the soil. Later leaves are v-shaped. Its reproduction potential is enormous, with up to 135,000 seeds per crowsfoot plant. Crowsfoot can grow from seedling to a flowering plant in approximately 5 weeks under optimal conditions; under less than ideal conditions, it may be as long as 4 months. Scientifically known as ‘Poa annua’, this grassy weed is commonly called Poa, wintergrass or annual bluegrass. A commercially significant weed of cool climate golf greens, the light green leaves of ‘Poa annua’ often cause an unsightly contrast to the dark green leaves of the turf species they invade. It can also significantly change the surface characteristics of sports turf surface by weakening the desired species (competing heavily for light, water and nutrients) and by changing performance characteristics such as ball roll, traction and physical appearance. ‘Poa annua’ is fast growing in comparison to other turf species, therefore the lime green foliage, and inflorescence if developed, will generally stand taller and provide a contrasting colour to the desired turf canopy. A member of the Poaceae family, ‘Poa annua’ can have either a tufted or creeping growth habit as it is an extremely diverse grass species. There are commonly two forms of ‘Poa annua’, which include an annual type (normally tufted) and a perennial genotype (mostly prostrate). The perennial type can be categorized as, (i) a short lived perennial referred to as a “turf-type”, and (ii) a long-lived perennial that thrives under the extremely close mowing heights of golf greens, referred to as “greens-type”. The variation present within the species allows herbicide resistance and a high degree of regenerative potential. Culms (stems) of the ‘Poa annua’ plant can be up to 30cm if left unmown. The soft, narrowly linear, flat, smooth leaves are up to 3.5 mm wide. Foliage is often lime green in colour for the annual types and darker green in colour for the perennial. Commonly ‘Poa annua’ can produce multiple to several inflorescence (panicles), which can grow up to 7 cm if left unmown. Perennial types produce fewer inflorescences and form patches from short stolons. Spikelets of the inflorescence are up to 5.5 mm are closely spaced with 3-7 flowers. Poa annua is a widespread environmental weed that thrives in temperate to sub temperate climates, but can extend well beyond these limits to be a problem in tropical managed turfs. Both annual and perennial forms of ‘Poa annua’ reproduce by seed, while perennial types can spread by short stolons. The annual type can complete its lifecycle in approximately 2 months. However, during this short period, commercially significant damage can occur if seed is able to germinate freely. 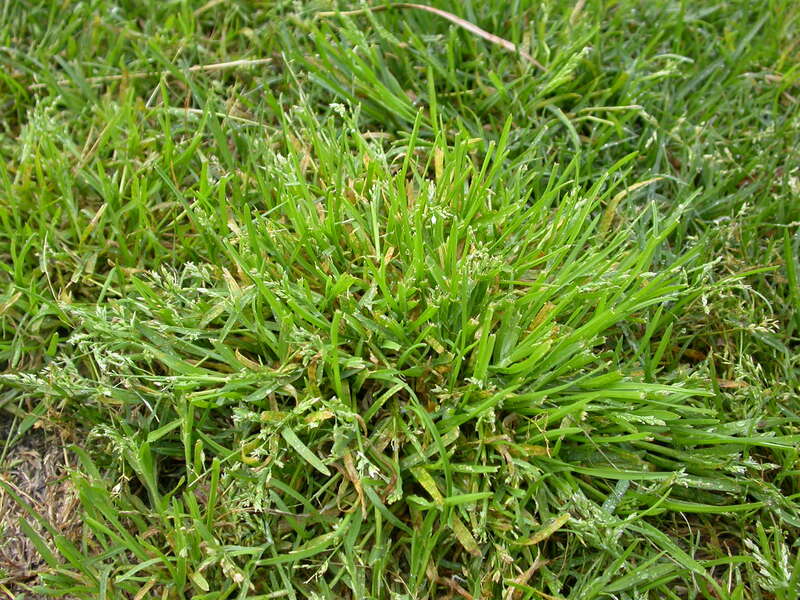 It has been estimated that annual Poa seed densities are commonly 200,000 per square metre in infested lawns. Seed head (inflorescence) emerges after a growing point changes from the vegetative to the reproductive state. Subsequent elongation of the flowering stem (culm) elevates the inflorescence so that developing seed can disperse and provide new plants when conditions for germination and seedling growth are favourable. Turf Forensics® is the complete online resource for professional turf managers. © 2016 Turf Forensics. All Rights Reserved.